OK, is it still cheaper to manufacture goods in China and other areas around the world? Yes, but if you factor in some of the intangibles and trends manufacturing in the USA might make far better business sense! A recent survey of 200 executives of large USA manufacturers, conducted by the Boston Consulting Group, found 21% were currently relocating production back to the USA, or currently planning to move in the next two years. In addition, 33% said they were considering moving manufacturing back to the USA in the near future. Reshoring manufacturing back to the USA, near-shoring it to Mexico or just keeping it here in the USA relies on some basic business principles. Do it smarter, faster and better than your competition… and make it profitable! Depending on the type of industry you are in, the benefits can be huge or minimal, but usually when combined make good business sense. Faster to market– less time on the water and faster from R&D to production and to customers hands. Higher US labor productivity– between US labor force work ethic and technologies we employ it’s very difficult to find better. No currency fluctuations– US currency has been very stable and most times represents the largest consumer base. Stable government (even despite shut downs and cliff threats) – joking aside, there is very little real changes in the government which can change an organizations value proposition overnight. Reduced supply chain costs– manufacturing and distributing in the same region reduces shipping costs and helps mitigate against complicated and time consuming supply chains. Dramatically reduce cultural and language barriers that lead to errors and mishaps– this is the real wild card with horror stories costing organizations tens and hundreds of thousands of dollars in just minutes. So the trend to reshore and nearshoring is not based on a sense of patriotic fervor, but rather the financial realities of business. There is quite a difference in the labor rate, but it is trending higher.Chinese labor costs have been increasing 15% to 20% in comparison to a USA 1.6% annual increase. Likewise, the Chinese RMB currency has increased 25% annually. The goal is to look at efficiencies in both manufturing and distribution to make the strategic decision of manufacturing in the USA logical. Automation is one of the greatest assets in improving efficiencies, but what and where in your facility does it make sense? Sequencing and buffering of large items by hand (or fork lift) when it could be cost effectively automated, eliminating labor, floor space and increasing accuracy. Having more packers than pickers. This is usually a sign that something is wrong and that labor and space are being wasted. Not able to take orders in at 3 or 4 pm and ship that same day. Having more than a dozen order pickers in a manual operation cries for some form of automation that will reduce labor from 25% to 66% while increasing accuracy and extending cut-off times. Having manufacturing, customer service and distribution spare parts and inventories in different locations or systems. Conduct a labor and space survey or ask an outside consultant and integrator to do one for you. Seeing the opportunities and value lying beneath the surface could make a big difference in your profitability. 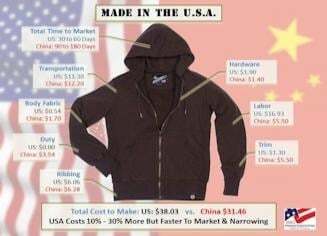 American Giant, (graphic above) a very successful San Francisco, CA, clothing manufacturer compared costs in China vs. USA. They found a 17% difference (and shrinking) in cost. They determined that the average 45 days to market vs. 120 days, eliminated supply chain disruptions and communications mishaps and supply chain risks and costs were well worth the difference. Integrated Systems Design (ISD) based in Wixom, MI manufactures all UltraProducts in the USA. Being able to build and install an ASRS system in the same time it takes for other manufacturers to begin shipping from Europe or Asia is often important to its customers. Likewise, using components readily found in the North American market make it much easier to maintain and manage for years to come. Manufacturing this in China would mitigate these customer benefits. The pundits are predicting that within three to five years the cost to manufacture in China will be the same as manufacturing in the USA. This likely isn’t the end of manufacturing in China, but rather having Chinese facilities geared up to meeting the domestic market demands which are growing exponentially. What is your company plans? Let us know your experience and findings so we can include them in a story. Email us.